Zimbabwe is closer to complete collapse than ever, and the regional initiative to find a negotiated political solution must be fully supported, a report says. The International Crisis Group, based in Brussels, says Southern African countries are the only ones with a chance of making a difference. South Africa's president is trying to mediate between Zimbabwe's governing Zanu-PF party and the opposition. But the independent think tank says this regional initiative is fragile. It points out that some Southern African leaders remain supporters of Zimbabwe's President Robert Mugabe and there is a risk they will accept cosmetic changes that further entrench the status quo. But this new report says inflation in Zimbabwe is at least 7,500%, four out of five people live below the poverty line and a quarter of the country's population has fled. The International Crisis Group says Western sanctions have proved to be largely symbolic, and British and American condemnation of Zimbabwe has been counter-productive. 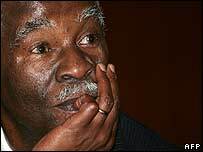 It says all international actors should close ranks behind the mediation efforts of South Africa's President Thabo Mbeki. Southern African countries should also enlist a panel of retired African presidents to persuade Robert Mugabe to accept reforms and retire next year, the report says.